A delicate sphere of gas, photographed by NASA's Hubble Space Telescope, floats serenely in the depths of space. Called SNR 0509-67.5, the bubble is the visible remnant of a powerful stellar explosion in the Large Magellanic Cloud, a small galaxy about 160,000 light-years from Earth. NASA's Hubble Space Telescope has photographed what lookslike a festive holiday bauble in space ? a delicate sphere of gas floatingserenely in the cosmos. The festive bubble, formally known as SNR 0509-67.5 (or SNR0509 for short), is the result of gas that is being shocked by the expandingblast wave from the supernova explosion. Astronomers think the stellar explosion was a Type Ia supernova,which is an especially energetic and bright variety. Type Ia events are thoughtto result from a white dwarf star in a binary, or two-star, system that robsits partner of material, taking on more mass than it is able to handle, which eventuallyresults in a violent explosion. The rippling effect that can be seen in the shell's surfacemay be caused by subtle variations in the density of the surroundinginterstellar gas, the researchers said. The undulations could also be drivenfrom the interior of the bubble by pieces of the ejecta. ? The sphere of gas measures about 23 light-years across, andis expanding at more than 11 million mph (about 18 million kph). The Hubble Space Telescope's Advanced Camera for Surveysobserved the SNR 0509 supernova remnant on Oct. 28, 2006 using a filter that isolateslight from glowing hydrogen seen in the expanding shell. These observationswere then combined with visible light images of the surrounding star field thatwere capturedby Hubble on Nov. 4, 2010. 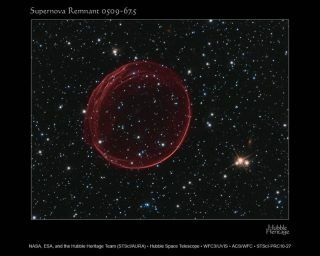 As seen from Earth, the supernova ? which is about 400 yearsold ? might have been visible to southern hemisphere observers around the year1600. There are, however, no known records of a "newstar" in the direction of the Large Magellanic Cloud near that time. Decades earlier, famed 16th century astronomer Tycho Brahedid spot what he called a "new star" in the sky in 1527. That starturned out to be the supernova explosion of a star in the constellationCassiopeia, and was visible from the northern hemisphere, not southern. A more recent supernova from that galaxy, called SN1987A, caught the eye of Earth viewers, and continues to be studied withground- and space-based telescopes, including Hubble.